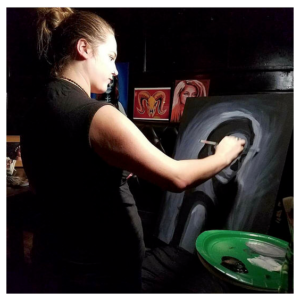 Owner and founder of Hanalei Artworks, Cayce Hanalei, received her Fine Art degree and Business degree in 2013 and currently resides in Chula Vista, California. She specializes mostly in portraits but loves to play around with different mediums and subject matter. 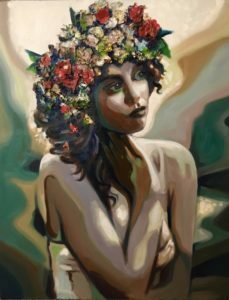 She has been featured in many National and International exhibitions, including shows at The Studio Door and Art on 30th. Her studio is located at La Bodega gallery in Barrio Logan where she currently works on her most recent projects. I enjoy painting people not only because the human figure is fascinating but no matter who you are we all have one thing in common, we are ALL human. Regardless of religion, color, race, sexual orientation, we all have something beautiful and unique within us. I find it extremely therapeutic when I try to expose that truth in each piece. It's a revelation that I try to instill in all of my work. I want my viewers to relook at something they see every day, their human nature, and see it laced with value and beauty. "I hope that when people view my work they relook at something they see every day, their human nature, and see it laced with value and beauty."